Yet another Snowbowl lawsuit. In this one the tribe, trying once again to stop the use of reclaimed wastewater to make snow on the San Francisco Peaks, filed a public-nuisance claim in state court. Before answering the question the Supreme Court addresses the standing issue. What standing issue, you ask? That’s the point — there is no standing issue; that a tribe could bring such a case was not contested. Both courts below — and so, apparently, the parties — had seen the special-injury requirement as a matter of “standing.” The court points out that “special injury is [an] . . . element of a private nuisance . . . claim,” not a matter of “standing.” The court then accepts the blame since it called special injury a “standing” issue in Armory Park (1985), on which this opinion is largely a commentary. The court frames the question as whether the public’s interest in keeping an area pristine differs in kind or quality from a tribe’s religious interest in keeping an area pristine. The answer is that it does not. “[T]he only public nuisance cases in which we have recognized special injury involved property or pecuniary interests . . .” And even if they didn’t — which the court admits (in a paragraph apparently added after its author read the dissent) that they didn’t do so “expressly” — limiting “special injury” to property and pecuniary matters is a good idea. That’s because its consistent with the reasons for the special-injury requirement, which are to prevent multiple actions for a single, common wrong and to prevent courts from taking over the regulation of such issues from other branches of government. It may be more helpful to understand those as reasons not for the special-injury requirement but for the general rule to which it is an exception: a private action doesn’t lie against a public nuisance. But that’s the way they were described in Armory Park. In any event, what the court is saying is that the exception, if not limited, devours the rule; if “special injury” is subjective then anyone can sue to block anything regardless of any administrative or legislative conclusion or decision. The rest of the majority opinion expands on this in the course of discussing the precedent in quite some detail. The dissent says that “the general public does not have millennia of religious practice in the area that will be covered in a fine film of reclaimed sewage.” That gives you the flavor of it — rather more elegantly written than the majority, despite the questionable metaphor, but more a brief than an opinion. The dissent repeatedly mentions the claimed age of the religious practices — “millenia” — which is thoroughly unprovable factually but which does raise interesting issues about the law of nuisance, none of which the dissent mentions. 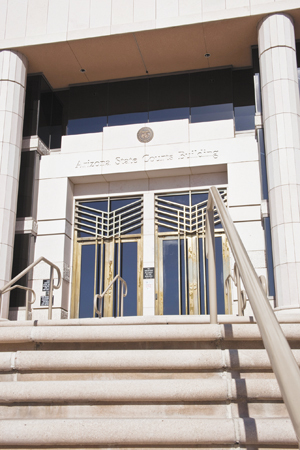 We blogged the Court of Appeals’ opinion here; go there for the facts. The Supreme Court vacates that opinion, reverses, and remands. “[W]e conclude that negligence and intent are mutually exclusive grounds for liability.” “It follows that if a defendant acts with the intent to cause a harmful or offensive touching (battery), that same act cannot constitute negligence.” Neither negligent use of intentional force nor negligent evaluation of whether to use force is a tort. The trial court should have granted the defense motion for summary judgment on negligence. Treating it as an an intermediate order affecting the judgment, the court remands for its entry. The court also addresses other issues “to provide guidance.” Since they’re dicta the guidance value is not entirely solid; the court seems drawn to comment on them because the parties briefed them, which is the cart pulling the horse. In any event, the court says that the jury shouldn’t be instructed on 13-409 (defense of justification regarding arrest or escape) in a negligence case and that when it is used in a civil case the defendant bears the burden of proving it. And the court agrees with Judge Espinosa that expert witnesses shouldn’t purport to tell the jury what the legal standards for justification are.